The IC-F60V delivers a loud 700mW* audio output with the built-in BTL amp. 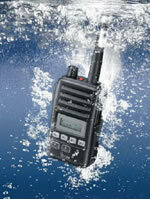 The built-in audio compander provides clear, low noise communications. Improved bass characteristics also betters the audio quality.